Beachside town works with FEMA to prevent future flooding. Long Branch is an oceanfront city of approximately 30,000 people in central New Jersey. Much of the city borders the Atlantic Ocean to the east or the Shrewsbury River to the north. In 2012, Long Branch was one of many coastal communities that experienced severe flooding during Hurricane Sandy. The hurricane caused nearly $69 billion in damages, making it the second-costliest U.S. hurricane on record at the time. As water levels rose in Long Branch during the hurricane, the city’s drainage system became susceptible to flow reversals. Water from tidal basins and the river backed up into apartment complexes and streets. Instead of drawing water away from the city, the city’s drainage system exacerbated the storm situation. To prepare for future severe weather events, the city decided to update its drainage system to better protect the coastline. The Federal Emergency Management Agency (FEMA) provided funds to upgrade Long Branch’s storm drainage system. As a result, the products used in this application needed to meet FEMA’s specifications. Long Branch decided to retrofit its current drainage system, which would allow the city to achieve its objectives without modifying much of its current infrastructure. However, working with existing structures created a challenge when designing the valves, since each site required a custom installation. An original equipment manufacturer (OEM) produced check valves for the project. Cost effectiveness was a key factor in choosing the check valves. These valves were on the storm water discharge side, which is the side of the piping system that drains into the ocean. This was to direct the storm waters into the ocean to prevent ocean flooding. FEMA approved the use of the OEM’s check valves for the project. The valves were custom made so that they can slide directly into the pipe for adequate sealing. The age of the piping system made it absolutely necessary to have a proper fit. The check valves were designed for each installation size so that the pipe size could be matched to the valve and the amount of head pressure association with the valve. Valves ranged in size from 12-inch diameter to 48-inch diameter and were installed on concrete and in polyvinyl chloride (PVC) pipes. The finalized design was implemented in 2017, and installation of the project was completed in early 2018. Installing the valves in these large pipes created some unique challenges. 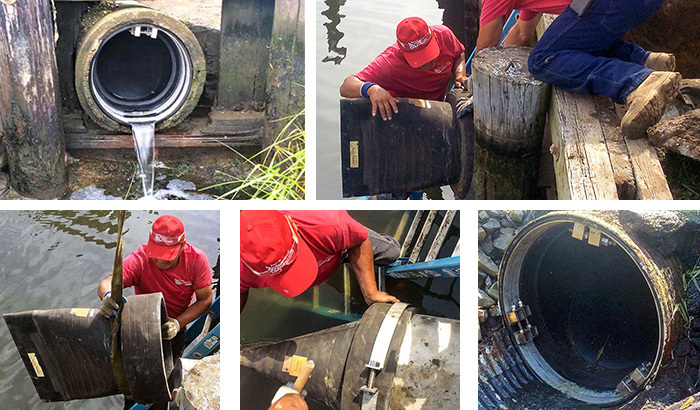 In some cases, pieces of deteriorated concrete pipe needed to be cut out before the valve could be installed. Also, since some installations were completed in water or on small boats, work needed to be scheduled with tides in mind. With Long Branch’s upgraded drainage system, each valve allows its respective location to drain properly under normal circumstances. In the instance of tidal reversal or flooding, the valves will shut off to prevent backflow. The city of Long Branch is now less susceptible to flow reversals during future severe weather events thanks to installation of the check valves. Cal Hayes is WaterWorks manager for Proco Products Inc. Hayes has been with the company since August 2005 and has more than 26 years of experience with check valves. Hayes may be reached at calh@procoproducts.com. For more information on check valves and expansion joints from Proco Products Inc., visit procoproducts.com.